(From left) SAI President Kirk Johnson, DE Director Ryan Wise, Central Office Administrator of the Year Stacey Cole, Arts Administrator of the Year Darwin Lehmann, Elementary Principal of the Year Gayle Allensworth, Secondary Principal of the Year Ryan Dumkrieger, Lt. Gov. Adam Gregg, Asst. Secondary Principal of the Year Brian Howes, Asst. Elementary Principal of the Year Cory Allison, Superintendent of the Year Greg Ebeling and Middle Level Principal of the Year Terry Hogenson. Nominations are made at the SAI district level by April 1. Forms will be available to district presidents and will be emailed to all SAI members no later than Feb. 25. 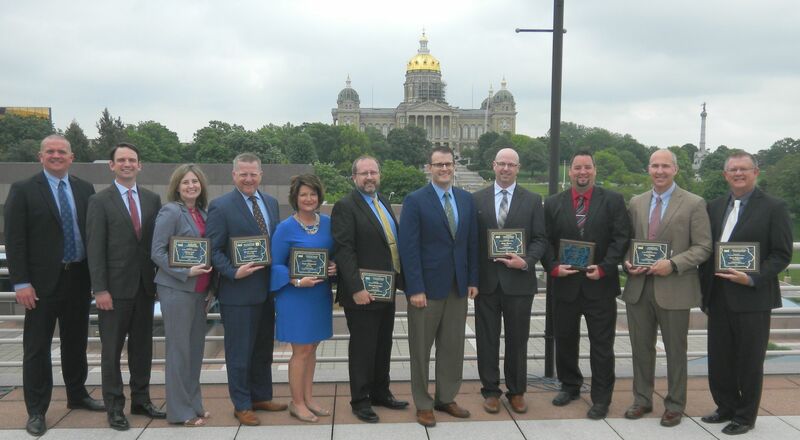 SAI district officers will submit one nominee in each category per SAI district, except Arts Administrator of the Year for which there may be multiple nominations, to the SAI office by June 30.